Background and objectives Despite advances in identifying genetic factors of diabetic kidney disease (DKD), much of the heritability remains unexplained. Nine maturity-onset diabetes in young (MODY) probands with kidney biopsy-proven DKD were selected and included in this study. The probands had more severe DKD compared with their parents with MODY, with overt proteinuria or rapid progression to ESKD. 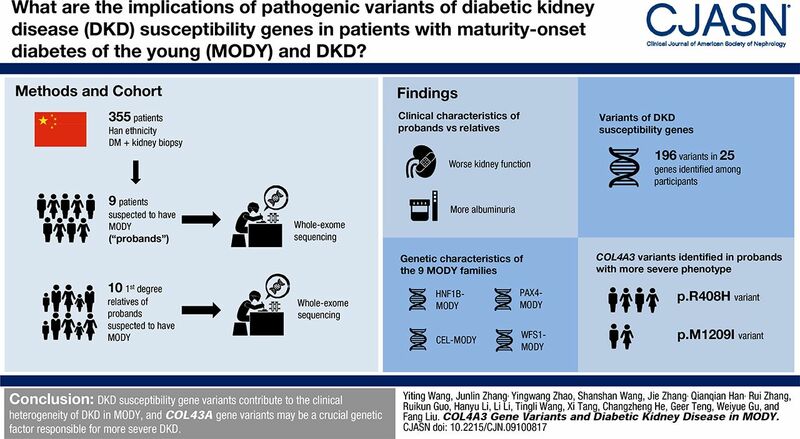 We aimed to explore the contribution of the variants in susceptibility genes of DKD to the severity of kidney phenotype between the probands and their parents. Design, setting, participants, & measurements Whole-exome sequencing was performed to identify suspected MODY probands and their families. Known DKD susceptibility genes were reviewed. Variants reported to be associated with DKD, or those with minor allele frequency <0.05 and predicted to be pathogenic, were selected and analyzed. Immunofluorescence staining of COL4α3 was performed in kidney specimens of patients with DKD with or without R408H and M1209I of COL4A3 variants. Results HNF1B-MODY, CEL-MODY, PAX4-MODY, and WFS1-MODY were diagnosed among nine families. We identified 196 selected variants of 25 DKD susceptibility genes among the participants. Analysis of phenotype between probands and parents, gene function, and protein–protein interaction networks revealed that COL4A3 variants were involved in the progression of DKD. Weak granular staining of COL4α3 was observed in the glomerular basement membrane of patients with the R408H and M1209I variants, whereas strong consecutive staining was observed in patients without these variants. Moreover, more number of DKD variants were identified in probands than in their parents with MODY. Conclusions The genetic effect of more pathogenic variants in various DKD susceptibility genes, especially variants in the COL4A3 gene, partially explained the more severe kidney phenotype in probands with kidney biopsy-proven DKD. Diabetes mellitus is a heterogeneous metabolic disorder that can be classified as type 1, type 2, or monogenic diabetes; maturity-onset diabetes of the young (MODY) is reported to be the most common type of monogenic diabetes (1). MODY has been classified into 14 subtypes according to the Online Mendelian Inheritance in Man (OMIM) database and characterized by autosomal dominant inheritance, young age at onset, and continued secretion of endogenous insulin (2). The precise diagnosis of MODY on the basis of genetics and phenotypic characteristics allows for more informed decisions to be made regarding treatment, resulting in improved prognosis (3,4). However, the current knowledge informing these decisions remains inadequate. Studies of MODY are mainly restricted to European populations and approximately 1.1%–4.2% of children with diabetes suffer from MODY (5–8). Despite the improved clinical care and prognosis of patients with diabetes, diabetic kidney disease (DKD)-associated ESKD remains a large global burden, not only in developed countries, but also in China (9–11). Given the health care burden associated with DKD, and that the heritability for the clinical heterogeneity remains unexplained, there has been much interest in search for genetic factors of DKD (12). MODY is commonly misdiagnosed as type 1 or type 2 diabetes mellitus, and cases of MODY with DKD have rarely been reported (13). Here, nine MODY probands with biopsy-proven DKD were studied. Notably, the different severity of DKD between probands and their parents who were diagnosed with MODY prompted our further investigation into the contribution of variants of DKD susceptibility genes to the severity of kidney phenotypes. A total of 355 patients with diabetes mellitus who underwent kidney biopsy in West China Hospital of Sichuan University from January 2001 to June 2017 were reviewed, and genetic information of 120 patients was obtained. Among them, 30 patients had a family history of diabetes. After taking clinical and genetic characteristics into account, nine patients were diagnosed as MODY and regarded as probands (Figure 1). The diagnosis of diabetes was made on the basis of the recommendations of the American Diabetes Association (1). The general indications for kidney biopsy of patients with diabetes in our hospital were patients with diabetes with kidney damage who lacked absolute contraindications, especially those without diabetic retinopathy, those with obvious glomerular hematuria and/or sudden onset overt proteinuria, or patients with short diabetic duration (<5 years). The diagnosis of MODY was made on the basis of the genetic and clinical characteristics of the American Diabetes Association and recommendations of previous studies (4,14,15): (1) diagnosis of diabetes at an early age (<40 years old), (2) strong family history of diabetes, (3): negative diabetes-associated antibodies, (4) nonobese and lacking other metabolic diseases, and (5) pathogenic variants in known MODY genes. Nine probands were selected from the study participants. Whole-exome sequencing was performed on the nine probands’ families as well. The severity of DKD was compared, focusing on the following aspects: (1) the duration of diabetes, (2) the duration of diabetes before progression to DKD, (3) the degree of proteinuria, (4) the eGFR calculated with the 2009 CKD Epidemiology Collaboration creatinine equation (eGFR), and (5) the stages of CKD. Written informed consent was obtained from all of the participants and the study was approved by the ethics committee of the West China Hospital of Sichuan University. The clinical parameters of the probands and their families were collected. Kidney biopsy was performed on all probands and the specimens were routinely processed for light microscopy, immunofluorescence, and electron microscopy to detect pathologic alterations in the kidney. The diagnosis and classification of DKD was on the basis of the new pathologic classification established by the Renal Pathology Society (16). Peripheral blood samples of the subjects were collected and extracted using a Qiagen genomic DNA isolation kit (Qiagen, Hilden, Germany); genomic DNA samples were sheared by sonication. The sheared genomic DNA was then hybridized with NimbleGen 2.0 probe sequence capture array Roche, (http://www.nimblegen.com/products/seqcap/ez/v2/index.html) to enrich the exonic DNA (Joy Orient Translational Medicine Research Center Co., Ltd., Beijing, China). The libraries were first tested for enrichment by quantitative PCR and for size distribution and concentration using an Agilent Bioanalyzer 2100. The samples were then sequenced on an Illumina HiSeq 2500. Two parallel reactions were done for each sample. Exon-enriched DNA was sequenced by the Illumina HiSeq 2500 platform following the manufacturer’s instructions (Illumina). Raw image files were processed using the BclToFastq (Illumina) for base calling and generating the raw data. Low-quality sequence was filtered out using the quality score ≥20. The sequencing reads were aligned to the National Center for Biotechnology Information human reference genome (hg19) using BWA. Samtools and Pindel were used to identified single nucleotide polymorphisms and indels in the sequence. Data analysis is applied as below: (1) synonymous changes and single nucleotide polymorphisms with minor allele frequency >5% were removed (http://www.ncbi.nlm.nih.gov/projects/SNP), (2) nonsynonymous changes were filtered using Sorting Intolerant From Tolerant (SIFT) (http://sift.jcvi.org/) and Polyphen2 software, (3) analysis of the function of mutated genes and their relation to disease, and (4) the 1000 Genomes human whole-genome database, using data on the Han ethnicity, was used as the control group. All identified mutations in potential MODY genes and variants in the COL4A3 gene were further confirmed by Sanger sequencing analyses (Supplemental Figure 1). Selected variants were followed up with cosegregation studies. Then, DNA from all available members of MODY families was collected and PCR product was sequenced by ABI 3730XL and analyzed by DNASTAR software (ATP8B1:NM_005603;IGSF1:NM_001170961.1). To pinpoint the variants that were most likely to be relevant to DKD, we prioritized putative disease-causing mutations in all currently recognized susceptibility genes for DKD. A comprehensive catalog of risk genes and loci associated with DKD was generated by querying the OMIM and PUBMED databases for all entries that matched the keywords “diabetic kidney diseases” and “genetics.” A total of 102 genes reported to be involved in the pathogenesis of DKD were selected (Supplemental Table 1, references are included). For further characterization, we only retained the variants reported to be related with DKD, as well as the variants that had not been reported but (1) were predicted to mediate a loss-of-function effect and (2) had a minor allele frequency <0.05 but excluded synonymous changes, or missense mutation that was determined deleterious by two bioinformatics prediction tools (SIFT and Polyphen2) (17). The susceptibility genes identified in the probands and their families were analyzed by Gene Ontology. Filtered genes/proteins were analyzed by Retrieval of Interacting Proteins v10 (http://www.string-db.org/) and protein–protein interaction network was depicted. We fixed 4-μm frozen sections of kidney tissue in 4% paraformaldehyde for 10 minutes and then washed with PBS. Antigen blocking was performed with 2% BSA in Tris Buffered Saline with Tween at 37°C for 30 minutes. Sections were then stained with primary rabbit anti-COL4α3 (ab111742; Abcam) diluted in 2% BSA in Tris Buffered Saline with Tween at 37°C for 2 hours, then at 4°C overnight. The sections were washed with PBS and incubated with diluted secondary antibodies as goat anti-rabbit IgG/FITC (Merck Millipore, Billerica, MA) at 37°C in the dark for 1 hour, then stained with 4′,6-diamidino-2-phenylindole (Calbiochem) for 1 minute. A confocal microscope (Fluoview 1000; Olympus, Tokyo, Japan) with FV10-ASW software (version 1.7; Olympus) was used to assess the micrograph. Overall, there were four steps: (1) reviewed all of the DKD-related variants in published articles (Supplemental Table 1), (2) found out the distribution of those variants in probands and their families by manual work (Table 1), (3) compared and analyzed the different variants in group of probands and their families, and (4) combined it with pathway analysis. All of the participants involved in the study were of Han ethnicity. Nine patients with biopsy-proven DKD were diagnosed with MODY and regarded as the probands. We numbered them x-P (“x” represented family number and “P” denoted proband). In total, 19 participants were involved in the study including the probands and their first-degree relatives with MODY, x-M, x-F, x-B, and x-S representing mother, father, brother, and sister of the probands, respectively. The family trees are shown in Figure 2. Family tree of the probands. 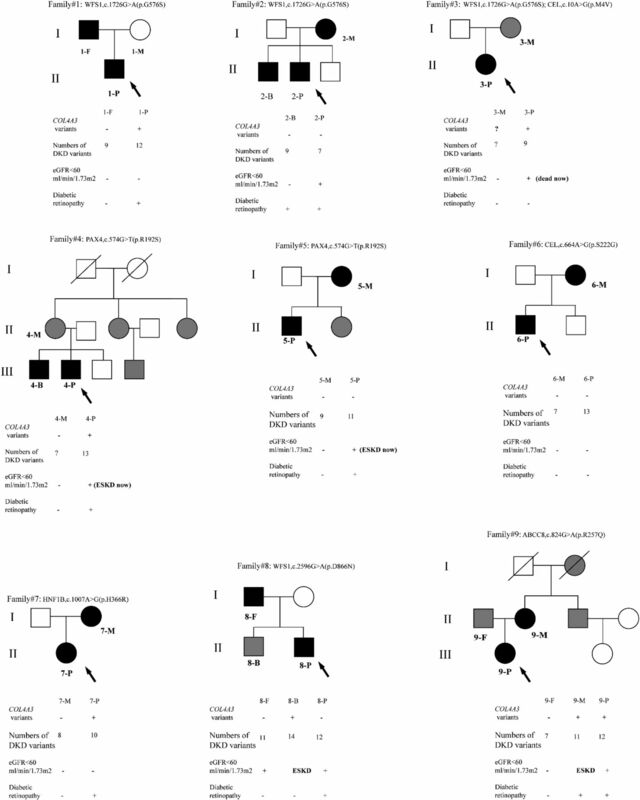 Arrows indicates probands; black represents families with variants in MODY genes; gray represents families with diabetes mellitus but genetic information is unknown; white represents blood glucose were normal of families; slash represents families who are dead. The clinical and biochemical characteristics of probands and their parental generation with MODY are displayed in Table 2. Higher levels of albumin-to-creatinine ratio (median, 3161; interquartile range [IQR], 2107–6034 versus median, 122 [IQR, 29–1474] mg/g), and worse kidney function (serum creatinine: median [IQR], 1.3 [1.0–1.7] versus 0.9 [0.6–1.5] mg/dl; eGFR: median [IQR], 56 [46–94] versus 70 [46–92] ml/min per 1.73 m2) were observed in probands group, despite shorter duration of diabetes than parental generations (median [IQR], 13.0 [10.0–17.5] versus 22.5 [20.0–23.8] years). Twenty four hour urinary protein for parental generations were incomplete as they exhibited normal albumin-to-creatinine ratio. On the basis of the glomerular classifications of the Renal Pathology Society in 2010, the biopsies of 2-P, 3-P, 4-P, 5-P, and 8-P showed classic Kimmelstiel–Wilson lesions and overt proteinuria and/or mild to moderate decreased eGFR; the biopsies of 1-P, 6-P, 7-P, and 2-B showed mild to severe mesangial expansion; and the biopsy of 9-P showed advanced diabetic glomerulosclerosis. Seven of the nine probands had diabetic retinopathy, two of them developed ESKD and received dialysis, and 3-P was dead. However, the severity of kidney injury of their parents with MODY was obviously milder (Supplemental Table 2, Table 2). Remarkably, 4-P and 5-P quickly progressed to ESKD after the diagnosis of DKD. 8-P had overt proteinuria, and his MODY brother required kidney replacement therapy, whereas his MODY father just had mild proteinuria and moderately decreased eGFR. In family 9, the onset age of DKD of the proband was much younger than her MODY mother, who had progressed to ESKD already. That may suggest accelerated progression to ESKD in 9-P. In our study, the nine MODY families with DKD were diagnosed by genetics and phenotypic characteristics as HNF1β-MODY (18), CEL-MODY, PAX4-MODY, WFS1-MODY, and ABCC8-MODY (19) (Figure 2, Supplemental Table 3, Table 3). To investigate the effect of pathologic variants of DKD susceptibility genes to the different severity of DKD between the probands and their parents with MODY, 196 selected variants were detected among 25 DKD susceptibility genes (Supplemental Table 4, Table 1). Consistent with previous studies, known DKD susceptibility genes such as Angiotensinogen, Fatty Acid Binding Protein 2, and TGF-β1 had high variant frequency in our study. Interestingly, the total numbers of selected DKD variants in the probands group was 99, but in their affected parents it was 55. Notably, the p.M1209I variant of COL4A3 was found in 1-P and 3-P, and the p.R408H variant of COL4A3 was found in 4-P, 7-P, 8-B, and 9-P. 7-P acquired the variant from her father without MODY, whereas 9-P inherited it from her affected mother who had severe DKD. The variants of COL4A3 gene were detected in the patients with more severe kidney phenotype. We speculated that the additional variants in the proband were acquired from the other parent or de novo. The genetic stressors caused by incorporate variants may contribute to DKD severity. 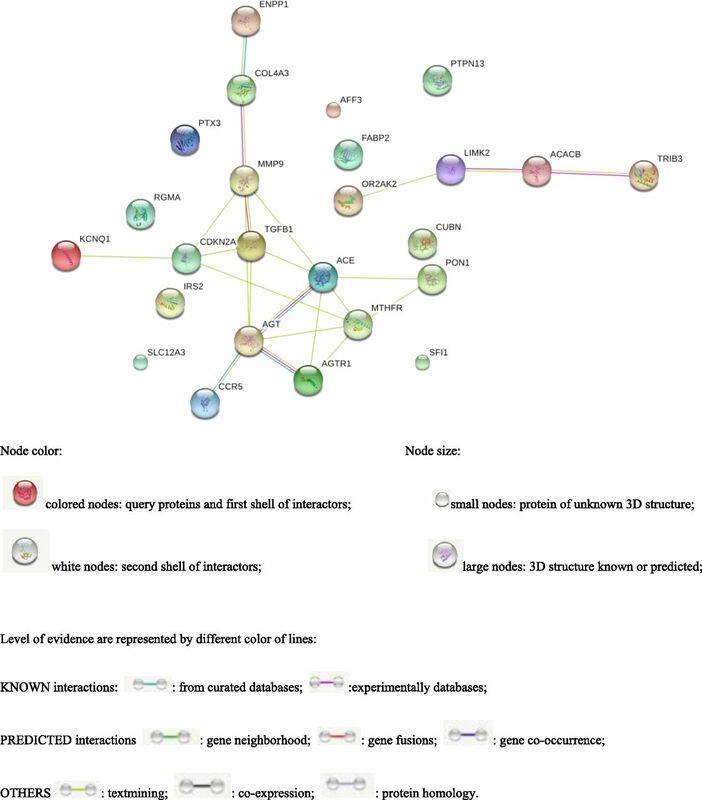 To further unravel the underlying pathophysiologic pathways of the 25 susceptibility genes of DKD, a protein–protein network map was produced using software. As Figure 3 shows, proteins that have been well studied previously (large nodes), are involved in classic and crucial DKD pathophysiologic pathways, and are supported experimentally by databases were selected (purple lines). Furthermore, variants of COL4A3 were present in five probands, as well as 8-B and 9-M who had both already processed to ESKD, suggesting that altered expression of COL4α3 protein plays a role in the pathogenesis of DKD. On the basis of the COL4α3 enrichment analysis, there were 39 pathways related to both COL4α3 and TGF-β (Supplemental Table 5). Protein–protein interaction pathway. COL4α3 is an important protein in pathophysiology pathways of DKD. 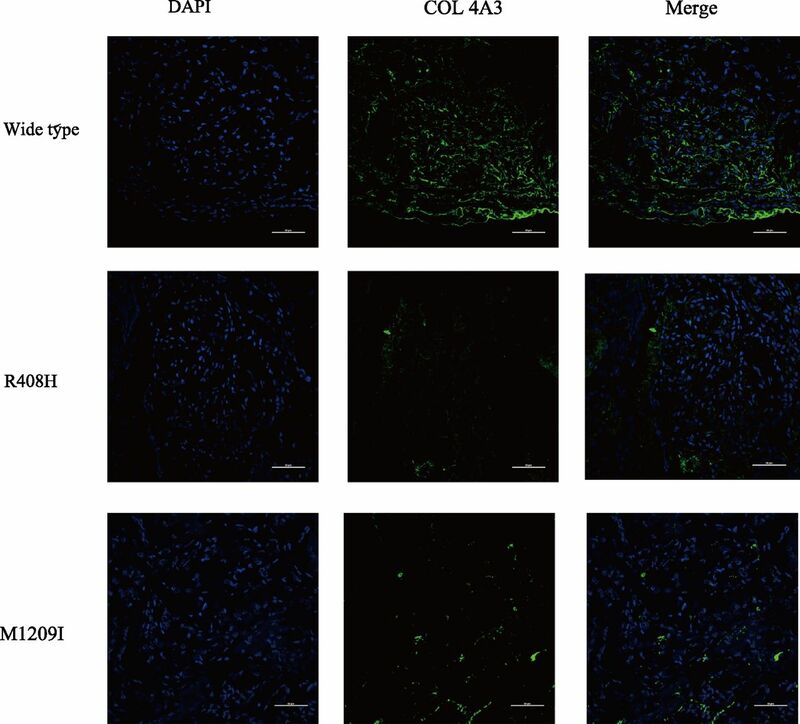 To further assess microstructural changes in the glomerular basement membrane (GBM), immunofluorescence staining of COL4α3 was performed on three patients with diabetic nephropathy, and all of the pathologic glomerular classifications were IIa. As shown in Figure 4, the patient without variants of COL4A3 exhibited strong and consecutive staining of COL4α3 in the GBM. Conversely, the patients who carried the R408H and M1209I variants displayed weak granular staining of COL4α3 in the GBM. The expression of α3 chain of collagen IV in patients with or without variants. Immunofluorescence staining was performed to analyze the expression of COL4α3. The green staining represents the expression of α3 chain of collagen IV in GBM: the patient without variants of COL4A3 exhibits strong continuous staining of COL4α3 in the GBM. Conversely, the patient who carries the R408H and M1209I variants display weak granular staining of COL4α3 in the GBM. Magnification ×40; scale bars, 50 μm. 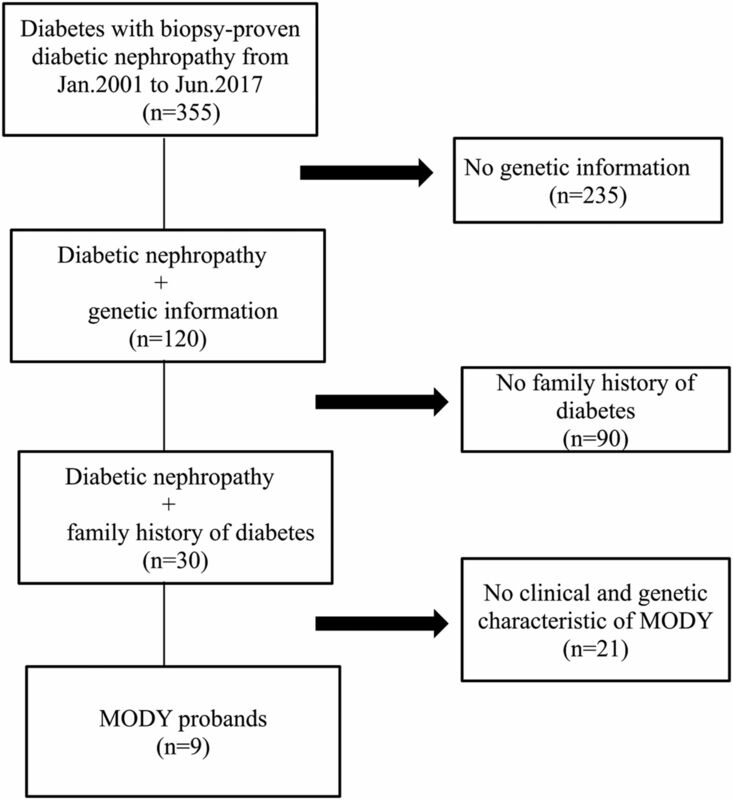 In this study, we identified nine MODY families, and the more severe DKD of the nine probands compared with their MODY parents were found to be associated with genetic stressors and COL4A3 gene variants. Although environmental factors and/or different lifestyles could explain the clinical heterogeneity of DKD partially, the influence of genetics was profound. Among these MODY families, four were diagnosed with WFS1-MODY, two with CEL-MODY, two with PAX4-MODY, and one with ABCC8-MODY. The result seems inconsistent with studies on European populations, which demonstrated a higher prevalence of HNF4α-MODY, HNF1α-MODY, and GCK-MODY (13). Moreover, chronic microvascular complications of MODY including DKD have been seldom reported (13,20). This could be attributed to the fact that the patients in our study were all recruited because of kidney complications, whereas the information regarding the distribution of MODY subtypes in other studies was on the basis of the presence of diabetes only, and not on complications. The rapidly increasing prevalence of diabetes is resulting in a concomitant increase in the prevalence of DKD (21). Given the large worldwide health care burden associated with DKD and ESKD, there has been much interest in the search for novel treatment targets. Although earlier efforts involving genetic studies of DKD have assisted in unraveling the underlying pathophysiologic pathways, identifying novel treatment targets, and exploring the causal role of candidate genes, only a limited number of variants have been verified associated with DKD at genome-wide significance (Supplemental Table 1) (22,23). The search for genetic factors of DKD has been even more challenging because of obstacles, including limited sample size of clinical studies, lack of kidney biopsy for the precise diagnosis of DKD (24), and the ability of genome-wide association studies to only detect common genetic variants (12). To reduce these limitations, whole-exome sequencing was performed to identify rare and low-frequency variants of kidney biopsy-proven DKD in our study. Although the sample size was limited, the difference in severity of DKD between the probands and their MODY families allowed us to investigate the association between genotype and phenotype of DKD. MODY also provided us a purer genetic background relatively to eliminate confounding diabetes genes to some extent. Genetic factors influence both the susceptibility and severity of a disease. First, using whole-exome sequencing, focusing on susceptibility genes of DKD, we found the probands acquired variants of MODY genes from their MODY parents; in addition, they inherited extra variants in genes that are associated with DKD from both parents with or without MODY. Thus, we suspected that the genetic stressors caused by incorporate variants may lead to the different phenotypes of DKD and more serious kidney damage. Second, using pathway analysis and Gene Ontology enrichment, among 25 DKD susceptibility genes selected in our study, variants of COL4A3 gene were found in five probands, 8-B, and 9-M, who both have processed to ESKD already, and the COL4A3-MMP9-TGF-β pathway is highly likely to be involved in DKD and accelerating its progression. Therefore, COL4A3 variants may be associated with DKD. The COL4A3 gene encodes the α3 collagen chain, a subunit of type IV collagen, which is the major structural component in mature GBM. Increasing evidence has shown that identical variants in COL4A3 are benign but related to autosomal recessive Alport syndrome (ARAS), FSGS, and benign familial hematuria (25–27). A recent study used whole-exome sequencing also demonstrated that variants in GBM were related to CKD (28). The mechanism by which the mutation affects the function of COL4A3 is not yet completely clear, but dysfunction of podocytes is considered likely. The specific mutation in COL4A3 will disturb the formation helical heterotrimers of collagen IV in the endoplasmic reticulum of podocytes. Therefore, misfolded proteins will be secreted to the GBM or accumulated in podocytes, disturbing the glomerular permselective barrier properties and activating downstream pathologic pathways (29,30). Recently, a genome-wide association study revealed that a rare variant in African populations, R408H (rs34505188), was associated with type 2 diabetes and -ESKD (31). The frequency of R408H is higher (0.1899) in Han Chinese, on the basis of the 1000 Chinese Genomes data, compared with European (0.069) and African populations (0.028) on the basis of 1000 Genomes Project data. In this study, probands in families 4, 7, 8, and 9 and a MODY mother with ESKD harbored this variant and had more severe proteinuria and accelerated deterioration of DKD. The variant p.M1209I of COL4A3, found in 1-P and 3-P, is a novel potential pathogenic variant contributing to the severity of DKD. Its minor allele frequency in the Han population is 0.009, and variant analysis indicated that the rare variant had a strong possibility to be detrimental (32). The altered expression of COL4α3, identified by immunofluorescence staining, also provided evidence that the R408H and M1209I variants had functional effects on COL4α3. Consistent with human heterozygous carriers, 30-week-old COL4A3+/− mice exhibited increased levels of TGF-β and connective tissue growth factor, and FGS and tubulointerstitial fibrosis (33), which were similar to the kidney pathology observed in DKD. Furthermore, matrix metalloproteinase-9 is involved in kidney fibrosis by degrading type IV collagen from the basement membrane and extracellular matrix (34). Taken together, we speculate that the dysfunction of COL4A3 gene variants may play an important role in the severer kidney injury of patients with DKD. We have identified several limitations of our study. First, the information of whole-sequencing exome of all of the parents were incomplete. Second, bias may have occurred because of the limited sample size. Third, further function analysis of the specific pathogenic mechanism of COL4A3 gene variants in DKD development is needed to confirm this work. In conclusion, the genetic stressor of DKD susceptibility genes variants contribute to the clinical heterogeneity of DKD, and COL4A3 gene variants may be a crucial genetic factor, responsible for the exacerbation of DKD. We thank Colleen Elso, from Liwen Bianji, Edanz Editing China (www.liwenbianji.cn/ac), for editing the English text of a draft of this manuscript. This study was supported by grants 81670662 and 81370823 from the National Natural Science Foundation of China. See related editorial, “Genetic Contribution to Risk for Diabetic Kidney Disease,” on pages 1135–1137. This article contains supplemental material online at http://cjasn.asnjournals.org/lookup/suppl/doi:10.2215/CJN.09100817/-/DCSupplemental.